After comparing several competing tenders, the CPVPV chairman in Saudi Arabia selected the tender submitted by Harf Information Technology for the e-Training project, which intends to develop the e-training process for the Committee members in different parts of the Kingdom of Saudi Arabia. Dr. Yusuf ibn `Abdullah Al-`Uraify, Harf E-learning Manager, said that the project includes the supply and installation of the e-training system (Tadarus); training Committee members on its use; developing some e-learning courses on administrative and Islamic issues for employees; and providing some technical and other equipment. On this occasion, Harf Information Technology would like to thank officials at the presidency of the CPVPV for choosing Harf to implement this project using Tadarus system. Harf in turn will use its expertise to implement the project at the highest standards, to enhance the development of the training activities at the Committee. Schools in Riyadh have signed a cooperation and partnership agreement with Harf Information Technology in the fields of software, e-learning, and application of Tadarus e-learning system. The agreement was signed by Dr. `Abdul-Ilah ibn `Abdullah Al-Musharraf, as a representative of Riyadh schools, and Dr. Ibrahim Salih Al-Nomay, Harf General Manager as a representative of Harf Information Technology. The agreement aims at providing an experimental and developmental environment that supports e-learning software and systems and promotes their success. Based on their belief that supporting Arab programs in general and local ones in particular is necessary for enhancing the developmental and leading role needed by the country and required by the national interest, the schools in Riyadh have chosen Tadarus e-learning to apply it to the perfect educational environment in their schools. Schools in Riyadh have, thus, cooperated with Harf Information Technology to develop similar programs that creates the perfect e-learning environment. Moreover, Dr. `Abdul-Ilah ibn `Abdullah Al-Musharraf – the Director General of Riyadh Schools – praised Harf as a leading company in the field of software and developing e-learning systems, hinting that Riyadh schools have always been seeking what elevates the level of the educational process and develops the teachers' technical abilities to best benefit the students. Such agreements clearly fulfill these objectives. On the other hand, Dr. Ibrahim Salih Al-Nomay, Harf General Manager, praised the schools of Riyadh for their outstanding achievements in the field of education and their technical capabilities, which contribute in ranking them among the major educational institutions in the Kingdom. Further, Dr. Ibrahim Al-Nomay expressed his happiness for signing this agreement, hoping for more constructive cooperation with the schools of Riyadh and other distinguished educational institutions. Harf participating in an international seminar on Arabic lexicon and computer. 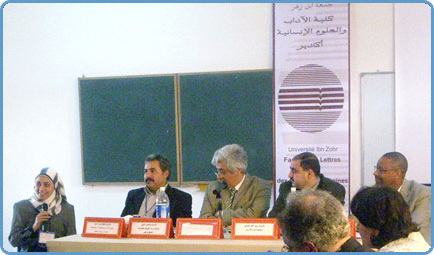 On March 21 and 22, 2008, Harf Information Technology has participated in an international seminar organized by the Language, Society, and Semitic languages Research team in the Faculty, L'association Marocaine des Etudes Lexicographiques (the Moroccan Society for Lexical Studies), and the Arabic Lexical Society in Tunisia. The seminar was hosted by the Faculty of Letters and Human Sciences, Ibn Zahr University, Agadir, Morocco. The seminar was on "the New Arabic Lexicon and the Challenges of Globalization – the Lexicon and Computer". Harf was represented by Fatin Al-Khouly, a linguist in the E-Publishing Department, who participated with a research on the e-dictionary and Harf's efforts on developing e-dictionaries and lexicons. In her speech, Fatin talked about the successful and leading experience of Harf in the development of e-dictionaries and lexicons, and gave an example in the Islamic Dictionary. It is the first specialized e-dictionary that includes a huge number of terminologies covering all fields of Islamic sciences with their translations into English, French, Indonesian, and Malaysian. It, thus, combines between being a specialized dictionary and a multilingual one. Harf Information Technology continues with its successful efforts in serving the Arabic language and making use of advanced technologies in developing a comprehensive dictionary software, an Arabic automatic morphological analyzer, an Arabic search engine, an automatic compiler based on a huge thesaurus such as the Comprehensive Arabic Thesaurus and the Comprehensive Islamic Thesaurus, and an automatic summarizer based on accurate linguistic analysis for Arabic words and sentences,…etc. - Dr. Ibrahim ibn Murad, Head of the Arabic Lexical Society, Faculty of Literature, Arts, and Human Sciences, Manubah, Tunisia. - Dr. `Adbul-Ghany Abul-`Azm, Head of the Moroccan Society for Lexical Studies, Faculty of Literature and Human Sciences, `Ayn Al-Shaqq, Morocco. Al-Jawf University in Saudi Arabia selects Harf Information Technology to execute its new e-Admissions project. The system will allow new applicants to submit their admission papers to the university and select the faculties of their choice via the university’s website. They will receive the result of their application by email or SMS, without needing to go to the university campus, and thereby avoid the crowds and inconvenience. Harf has signed a contract with the General Presidency of the Promotion of Virtue and Prevention of Vice for a new project. Harf has undertaken to establish and develop an electronic portal for the General Presidency on the Internet. The website will be built on the SharePoint 2007 platform. - Development of the department's intranet portal using the Share Point platform. - Provision of an electronic mechanism to organize the workflow of the department's administrative communication. - a collection of all the processes used and their documentation. - a detailed description of each process. - work meetings and educational workshops related to the documentation. - a comprehensive study and assessment of the current situation in relation to regulations, processes, and modules. - a unification of all the measures and standards of the applied modules. - a special guide to the modified processes. - a simplified guide to the complicated and routine processes. 2. Creating a digital map of all the engineered processes. 3. Training the responsible ministry employees on the processes digital map. Harf has signed a consultative study contract with Intel Egypt to develop an interactive educational website for elementary and preparatory levels, under the auspices of the Egyptian Ministry of Education. The purpose of the study is to estimate the work that will be required for the project, and to define the preliminary website requirements, specifications, and infrastructure. Harf has also signed another contract with Intel to develop an experimental website, "Skoool Egypt", to demonstrate Harf's expertise in developing interactive educational websites. On 4 September,2007, corresponding to 22 Sha'ban 1428 AH., Harf signed a contract with Imam Muhammad ibn Saud Islamic University for developing phase one of a new external students system for electronic distance learning. Using this system, the university will be able to enroll external students electronically and offer them distance education through Tadarus, the e-Learning administration system developed by Harf. More details: The Distance Learning Department at Imam Muhammad ibn Saud Islamic University has now started phase one of the new e-Learning system for external students. This year, external students will be able to enroll electronically through the new program and attend classes via the Internet. The President of the university, Dr. Sulayman ibn 'Abdullah Abul-Khayl explained, "Based on the wise leadership of the Custodian of the Two Sacred Mosques, King 'Abdullah ibn 'Abdul 'Aziz, and that of his trusted Crown Prince, and on the noble aims of increasing the enrolment of both male and female students at the university, offering the chance of a university education to all those who want it, and investing in modern technologies for the advancement of education, the university has launched the first phase of the external students program through its Distance Learning Department." Harf is honored to be responsible for the support and development of the technical aspects of the new system. Dr. Yousuf Al-Oraifi, the e-Learning Services Manager at Harf, expressed his happiness at the successful conclusion of the first phase of the project and he hopes the same for the coming phases and that the program will soon also be used at other universities. Harf Information Technology has signed a contract with the International Holy Qur'an Memorization Institute to develop a Qur'anic memorization e-School on the Internet. The aim of the project is to develop a website for the memorization of the Holy Qur'an. Those who wish to learn and memorize the Holy Qur'an will be able to access the website from wherever they are, enroll themselves in the study groups, and participate in distance learning through the e-School. This will definitely expand the target audience benefiting from the Qur'anic memorization projects offered by the International Holy Qur'an Memorization Institute. More details: The International Holy Qur'an Memorization Institute has always been concerned with the teaching and memorization of the Holy Qur'an throughout the Islamic world. It now wishes to develop its methods for teaching and memorization of the Holy Qur'an by the addition of new educational tools and methods that are compatible with current developments and will benefit from the e-Learning technologies. The institute has, therefore, signed a contract with Harf Information Technology to develop a website for a Qur'anic memorization e-School on the Internet. The students will be able to access the memorization courses and attend the virtual classes to participate in lessons to memorize the Glorious Qur'an, exactly as if they were attending traditional classes. The website will also provide teachers with the ability to follow up students, give them assignments and tests, all of which will help them to monitor progress. For the second year in a row, Harf Information Technology has won two awards in the fields of e-entertainment and e-education at the National e-Content Competition organized by the Information Technology Industry Development Agency (ITIDA) in Egypt. The Company has also received certificates of appreciation for its efforts in the fields of e-Learning and e-Entertainment. For this year's competition, the Information Technology Industry Development Agency (ITIDA) called all companies, organizations and individuals interested in e-content to present their best products in the field. The Competition was held under the auspices of the Egyptian Minister of Communications and Information Technology, and ITIDA was responsible for supervising the executive works. Eng. Hesham Hussein, head of the Multimedia Department at Harf received the awards at a special ceremony attended by Dr. Tarek Kamel, Minister of Communications, Professor Peter A. Bruck, Chairman of The World Summit Award (WSA) organization, and leading figures in the industry of information technology and e-content. Harf Information Technology achieved a Level 3 Rating on the Software Capability Maturity Model Integration (CMMI), which is a clear indication of a high level of process maturity achieved at Harf. We are very proud to have achieved CMMI Level 3 accreditation, said Dr.Ibrahim Al Nomay, General Manager of Harf Information Technology. This is a significant milestone for Harf and evidence to our continued quality improvement efforts. Our prime goal is to achieve our clients' satisfaction according to Harf's general plans and bearing in mind cost reduction, simplicity of procedures, maintaining the efficiency of our staff and outlining some internal clear-cut work rules. We fully anticipate a natural evolution towards CMMI Level 5 accreditation in the coming years. Harf is a Microsoft Gold Certified Partner, Intel partner, and ISO 9001 certified, in addition to being CMMI Level 3, the accreditation levels exemplify Harf commitment towards establishing and maintaining predictable software development and systems engineering processes. The software Capability Maturity Model is today's standard for assessing a company's software development capability. CMMI is an internationally recognized and acclaimed framework from Software Engineering Institute (SEI), used for assessing and improving software development and systems' engineering capabilities. Its emphasis on project management and software engineering makes it a comprehensive model both at the organizational and the project management levels. The Level 3 accreditation signifies that Harf has developed successful processes ranging from project planning to delivery and has established a framework that allows Harf to consistently employ these processes.